Not to be confused with Mary Harlan Lincoln. Mary was born in Lexington, Kentucky as the fourth of seven children of Robert Smith Todd, a banker, and Elizabeth "Eliza" (Parker) Todd. Her family were slaveholders, and Mary was raised in comfort and refinement. When Mary was six, her mother died in childbirth. Two years later, her father married Elizabeth "Betsy" Humphreys and they had nine children together. Mary had a difficult relationship with her stepmother. Mary staunchly supported her husband in his quest to save the Union and was strictly loyal to his policies. Considered a "westerner" although she had grown up in the more refined Upper South city of Lexington, Mary worked hard to serve as her husband's First Lady in Washington, D.C., a political center dominated by eastern culture. Lincoln was regarded as the first "western" president, and critics described Mary's manners as coarse and pretentious. She had difficulty negotiating White House social responsibilities and rivalries, spoils-seeking solicitors, and baiting newspapers in a climate of high national intrigue in Civil War Washington. She refurbished the White House, which included extensive redecorating of all the public and private rooms as well as the purchase of new china, which led to extensive overspending. The president was very angry over the cost, even though Congress eventually passed two additional appropriations to cover these expenses. Mary also was a frequent purchaser of fine jewelry and on many occasions bought jewelry on credit from the local Galt & Bro. jewelers. Upon President Lincoln's death, she had a large amount of debt with the jeweler, which was subsequently waived and much of the jewelry was returned. Mary suffered from severe headaches, described as migraines, throughout her adult life, as well as protracted depression. Her headaches seemed to become more frequent after she suffered a head injury in a carriage accident during her White House years. A history of mood swings, fierce temper, public outbursts throughout Lincoln's presidency, as well as excessive spending, has led some historians and psychologists to argue that Mary suffered from bipolar disorder. Another theory holds that Mary's manic and depressive episodes, as well as many of her physical symptoms, could be explained as manifestations of pernicious anemia. As the Civil War ended, Mrs. Lincoln expected to continue as the First Lady of a nation at peace. President Lincoln awoke the morning of April 14, 1865 in a pleasant mood. Robert E. Lee had surrendered several days before to Ulysses Grant, and now the President was awaiting word from North Carolina on the surrender of Joseph E. Johnston. The morning papers carried the announcement that the President and his wife would be attending the theater that evening. At one point, Mary developed a headache and was inclined to stay home, but Lincoln told her he must attend because newspapers had announced that he would. She sat with her husband watching the comic play Our American Cousin at Ford's Theatre. During the third act, the President and Mrs. Lincoln drew closer together, holding hands while enjoying the play. Mary whispered to her husband, who was holding her hand, "What will Miss Harris think of my hanging on to you so?" The president smiled and replied, "She won't think anything about it". That was the last conversation the Lincolns ever had. 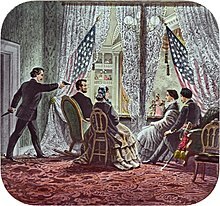 Minutes later, President Lincoln was shot by John Wilkes Booth. She was holding Abraham's hand when Booth's bullet struck the back of his head. Mrs. Lincoln accompanied her mortally wounded husband across the street to the Petersen House, where he was taken to a back bedroom and laid crosswise on the bed there, where Lincoln's Cabinet was summoned. Their son Robert sat with Lincoln throughout the night and to the following morning – Saturday, April 15, 1865. At one point, Secretary of War Edwin M. Stanton ordered Mary from the room as she was so unhinged with grief. President Lincoln remained in a coma for approximately nine hours before dying at 7:22 the next morning. Shortly before 7 a.m. Mary was allowed to return to Lincoln's side, and, as Dixon reported, "she again seated herself by the President, kissing him and calling him every endearing name." Lincoln died on the morning after the assassination. In an act approved by a low margin on July 14, 1870, the United States Congress granted Mrs. Lincoln a life pension of $3,000 a year ($59,439 in 2018 dollars). Mary had lobbied hard for such a pension, writing numerous letters to Congress and urging patrons such as Simon Cameron to petition on her behalf. She insisted that she deserved a pension just as much as the widows of soldiers, as she portrayed her husband as a fallen commander. At the time it was unprecedented for widows of presidents, and Mary Lincoln had alienated many congressmen, making it difficult for her to gain approval. The death of her son Thomas (Tad) in July 1871, following the death of two of her other sons and her husband, brought on an overpowering grief and depression. Her surviving son, Robert Lincoln, a rising young Chicago lawyer, was alarmed at his mother's increasingly erratic behavior. In March 1875, during a visit to Jacksonville, Florida, Mary became unshakably convinced that Robert was deathly ill; hurrying to Chicago, she found him healthy. During her visit with him, she told him that someone had tried to poison her on the train and that a "wandering Jew" had taken her pocketbook but returned it later. She also spent large amounts of money there on items she never used, such as draperies and elaborate dresses (she wore only black after her husband's assassination). She walked around the city with $56,000 in government bonds sewn into her petticoats (underskirts). Despite this large amount of money and the $3,000-a-year stipend from Congress, Mrs. Lincoln had an irrational fear of poverty. 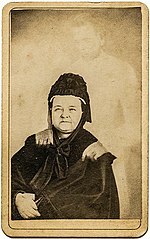 Mary Todd Lincoln with the "ghost" of her husband, in an image taken by spirit photographer William H. Mumler. Mumler's photos are now considered hoaxes. In 1872, she went to spiritualist photographer, William H. Mumler, who produced a photograph of her that appears to faintly show the ghost of President Lincoln behind her (photo in Allen County Public Library, Fort Wayne, Indiana). Mrs. Lincoln spent the next four years traveling throughout Europe and took up residence in Pau, France. Her final years were marked by declining health. She suffered from severe cataracts that reduced her eyesight; this condition may have contributed to her increasing susceptibility to falls. In 1879, she suffered spinal cord injuries in a fall from a stepladder. She traveled to New York in 1881 and lobbied for an increased pension after the assassination of President Garfield raised the issue of provisions for his family. She faced a difficult battle, due to negative press over her spending habits and rumors about her handling of her personal finances, including $56,000 in government bonds left to her by her husband. Congress eventually granted the increase, along with an additional monetary gift. Shortly afterwards, she returned to Springfield and her health deteriorated until she died a few months later. During the early 1880s, Mary Lincoln was confined to the Springfield, Illinois residence of her sister Elizabeth Edwards. On July 15, 1882, exactly eleven years after her youngest son died, she became unconscious and died the next morning of a stroke. Biographies have been written about Mary Lincoln as well as her husband. Barbara Hambly's The Emancipator's Wife (2005) is considered a well-researched historical novel that provides context for her use of over-the-counter drugs containing alcohol and opium, which were frequently given to women of her era. Janis Cooke Newman's historical novel Mary: Mrs. A. Lincoln (2007), in which Mary tells her own story after incarceration in the asylum in an effort to maintain and prove her sanity, is considered by Mary's recent biographer, Jean H. Baker, to be 'close to life' in its depiction of Mary Lincoln's life. The grief experienced through her widowhood is a theme of Andrew Holleran's 2006 novel, Grief. 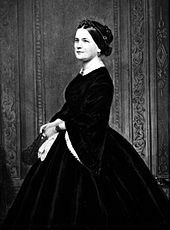 Mary Lincoln has been portrayed by several actresses in film, including Ruth Gordon in Abe Lincoln in Illinois (1940); Julie Harris in The Last of Mrs. Lincoln, a 1976 television adaptation of the stage play; Mary Tyler Moore in the 1988 television mini-series Lincoln; Sally Field in Steven Spielberg's 2012 film Lincoln; Penelope Ann Miller in Saving Lincoln (2012); and Mary Elizabeth Winstead in Abraham Lincoln: Vampire Hunter (2012), set during the Civil War. Mezzo-soprano Elaine Bonazzi portrayed Mary in Thomas Pasatieri's Emmy Award winning opera The Trial of Mary Lincoln in 1972. In 1955, Vivi Janiss played the historical Mary Todd Lincoln in "How Chance Made Lincoln President" in the anthology television series, TV Reader's Digest. Richard Gaines was cast as Abraham Lincoln, and Ken Hardison played their son, Robert Todd Lincoln. In 2005, Sufjan Stevens referenced Mary Todd Lincoln in the instrumental track "A Short Reprise for Mary Todd, Who Went Insane, but for Very Good Reasons" from his album Illinois, which is themed around the state where she resided the majority of her life. Her sister Elizabeth Todd married Ninian Edwards Jr., the son of the Illinois Governor Ninian Edwards. Their daughter Julia Edwards married Edward L. Baker, editor of the Illinois State Journal and son of Congressman David Jewett Baker. 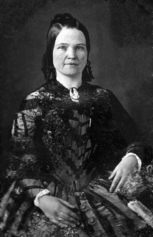 Their daughter, Mary Todd Lincoln's grandniece Mary Edwards Brown, served as custodian of the Lincoln Homestead, as did her own daughter. Mary's half-sister Emilie Todd married Benjamin Hardin Helm, CSA general and son of the Kentucky Governor John L. Helm. Another half-sister Elodie Todd married CSA Brig. General Nathaniel H. R. Dawson, later the third U.S. Commissioner of Education. One of Mary Todd's cousins was Kentucky Congressman/US General John Blair Smith Todd. ^ Mary Todd Lincoln House, National Park Service, (June 9, 1977). Retrieved on September 14, 2011. ^ Mary Lincoln. Firstladies.org. Retrieved on September 14, 2011. ^ a b Donald, David Herbert (1995). Lincoln. New York: Touchstone. p. 85. ^ "Springfield". Lincoln's Life. Abraham Lincoln Bicentennial Commission. Retrieved September 3, 2009. ^ "Abraham Lincoln and Chicago (Abraham Lincoln's Classroom)". The Lincoln Institute. Retrieved December 2, 2012. ^ "The Lincoln Boys". Library of Congress. Archived from the original on October 23, 2013. Retrieved December 2, 2012. ^ Davenport, Don (2001). In Lincoln's Footsteps: A Historical Guide to the Lincoln Sites in Illinois. Big Earth Publishing. p. 210. ^ Pearson, Patrick. "Understanding Mary Lincoln". Ford's Theatre. Retrieved October 3, 2018. ^ Flood, Charles Bracelen. 1864: Lincoln at the Gates of History New York: Simon & Schuster, 2010. ^ Norton, Mary Beth, . A People and a Nation: a History of the United States. Since 1865, Volume 2. Florence, KY: Wadsworth Publishing, 2011. ^ Baker 1987, pp. 188–190. ^ Packard 2013, pp. 88–90. ^ Halloran, Liz (July 27, 2001). "A Glittering History". The Hartford Courant. Retrieved March 27, 2019. ^ Holden, Charles J. (2004). "Abraham and Mary Lincoln: A house divided". Film & History: An Interdisciplinary Journal of Film and Television Studies. 34 (1): 76–77. doi:10.1353/flm.2004.0019. ^ a b c d e f Emerson, Jason (2006). "The madness of Mary Lincoln". American Heritage Magazine. 57 (3). ^ Graham, Ruth (February 14, 2010). "Was Mary Todd Lincoln bipolar?". Slate. Retrieved October 26, 2010. ^ Bach, Jennifer (2005). "Was Mary Lincoln bipolar?". Journal of Illinois History. ^ LaPook, Jonathan (July 16, 2016). "Mary Todd Lincoln: Doctor says first lady misdiagnosed". CBS News. Retrieved July 22, 2016. ^ John G. Sotos, What an Affliction – Mary Lincoln's Fatal Pernicious Anemia. Perspectives in Biology and Medicine. 2015; 58: 419–443. ^ Page, Yolanda Williams (2007). Encyclopedia of African American Women Writers. Greenwood Publishing Group. pp. 331–333. ISBN 9780313334290. OCLC 433369250. Behind the Scenes and Keckley were mocked and renounced by the press. ^ "1860s: An uneasy reaction to a White House memoir". White House History Timelines: White House Workers. White House Historical Association. Archived from the original on October 6, 2012. Retrieved July 3, 2012. Others believe that Keckley's unscrupulous editor tricked her into lending him Mrs. Lincoln's letters, which he then included in the book. ^ "277 – An Act granting a Pension to Mary Lincoln". Public Acts of the Forty-First Congress of the United States. Memory.loc.gov. p. 653. Retrieved May 7, 2012. ^ Jennifer Bach, "Acts of Remembrance: Mary Todd Lincoln and Her Husband's Legacy"
^ Mysteries at the Museum, season 2 (2011), "The French Connection" episode. ^ Mary Todd Lincoln's Stay at Bellevue Place, Showcase.netins.net. Retrieved on November 13, 2010. ^ Wellesley Centers for Women – The Madness of Mary Todd Lincoln | Women's Review of Books-May/June 2008 Archived September 23, 2008, at the Wayback Machine. Wcwonline.org (June 24, 2010). Retrieved on November 13, 2010. ^ Ellard, Kerry. "Nevertheless, She Persisted". Lincoln Abraham. LincolnAbraham.com. Archived from the original on August 5, 2017. Retrieved July 22, 2017. ^ Wead, Doug. All the Presidents' Children: Triumph and Tragedy in the Lives of America's First Families. p. 81. ^ "Mrs. Lincoln". Amazon.com. Retrieved March 2, 2013. ^ Bloomer, Jeffrey. "Was Mary Todd Lincoln Really "Insane"?". slate.com. TheSlate Group. Retrieved November 9, 2012. ^ John J. O'Connor (February 14, 1972). "Original Opera Tonight About Mary Lincoln". The New York Times. p. 59. ^ Reinhart, Mark S. (2009). Abraham Lincoln on Screen: Fictional and Documentary Portrayals on Film and Television. McFarland. p. 110. ^ "Sufjan Stevens – Sufjan Stevens Invites You To: Come On Feel The Illinoise". Discogs. Retrieved July 7, 2017. ^ "Eisenhower Thanks Mary Lincoln's Niece for the Gift of a 'Truly Historic Memento', 1952". Shapell Manuscript Collection. Shapell Manuscript Foundation. ^ "Elodie Todd Dawson Monument in Selma's Old Live Oak Cemetery". RuralSWAlabama.org. RuralSWAlabama. Retrieved August 20, 2017. ^ Kazek, Kelly (July 16, 2015). "13 of Alabama's most photographed cemetery monuments". al.com. Alabama Media Group. Retrieved August 20, 2017. Baker, Jean H. (1987). Mary Todd Lincoln: A Biography. New York: W.W. Norton & Company. ISBN 0393024369. Packard, Jerrold M. (2013). The Lincolns in the White House: Four Years That Shattered a Family. New York: St. Martin's Press. ISBN 0312313020. Emerson, Jason (2007). The Madness of Mary Lincoln. Carbondale, Illinois: Southern Illinois University Press. pp. 20–22. ISBN 978-08093-2771-3. McDermott, Stacy Pratt (2015). Mary Lincoln : southern girl, northern woman. New York: Routledge. LCCN 2014030118. Williams, Frank J. and Michael Burkhimer, eds. The Mary Lincoln Enigma: Historians on America's Most Controversial First Lady (Southern Illinois University Press; 2012) 392 pages; scholarly essays on her childhood in Kentucky, the early years of her marriage, her political relationship with her husband, and her relationship with her son Robert.